The American Cheese Society was founded in 1983 by Dr. Frank Kosikowski of Cornell University as a national grassroots organization for cheese appreciation and for home and farm cheesemaking. The first annual meeting was held in the summer of 1983 at Cornell, with 150 attendees made up of small-scale and home cheesemakers, retailers, academics and cheese enthusiasts. A slate of officers was elected and a Constitution and Bylaws were adopted at that first meeting, laying the foundation for future growth. The early years were marked by slow growth as the fledgling, all-volunteer organization coalesced through the dedicated efforts of a small circle of leaders from cheesemaking, academia and retail. The Competition began in 1985 at the Third Annual conference. 30 cheesemakers entered 89 cheeses in 7 categories. A mini Festival of Cheese was also held that year. A very successful 5th Annual Conference was held at the Four Seasons Boston and generated much press coverage. The script logo debuted at this conference. There were 170 entries in the competition and the first cheese sale/auction raised $800 for the Society. Growing pains were evident over the next few years. No conference was held in 1988 and several small conferences followed as the Society struggled to redefine itself, its mission and develop a flourishing, inclusive member base. The 1990s saw additional growth of the organization and American cheese. Through the efforts of the Society and its members, the quality and number of American cheeses increased and they became more mainstream and available at specialty retailers nationwide. Spurred by a number of books and articles on cheese and a large presence at gala foodie events in large cities, awareness grew. The membership and competition grew and coalesced around some key issues including the preservation of Raw Milk cheeses. In March 2000, the Cheese of Choice Coalition was formed by the ACS and Oldways Preservation Trust. The early 2000's brought additional structure and focus to the organization as a redefined mission statement and expanded committees advanced the organization, setting the stage for explosive growth from 2003 to 2008. During the last five years, membership increased from 776 members in 2003 to 1,418 members in 2007. At the same time, competition entries increased from 762 cheeses to 1,208 cheeses. From humble beginnings and guided by a vision that American Cheese could mean more than sliced single and that a community of cheese could be created, hundreds of dedicated and passionate individuals have united to create a vibrant and flourishing Society poised to continue to push the limits in the next quarter century." Last year I got to go to a few of the ACS seminars through work. It was AWESOME! Seriously. There are seminars specific to cheesemakers that really get into the scientific aspect of cheese. My friend Shannon (also a member-but for much longer than I've been) went to a lot of those since she is one day going to be a great goat cheese maker. There were seminars on cooking with cheese, and my favorite one was the one called "Is selling up selling out?" There was a rep from Costco, Whole Foods, and an independent retailer in Seattle. It was really interesting to hear different points of view, and to see them debate each other. The cheese buyer for our store got to participate in a seminar which was rather interesting too, but the best thing that happened was the "Festival of Cheese" which is held on the last day of the conference. Every single cheese that was entered in every single category is organized onto tables and offered up for sampling. Last year there were 1,149 cheeses. I think my favorite of the show was the Barely Buzzed (more on that later-promise) I think I was able to get about 250-300 tasted. Then there was no more room in the tummy. Oh yeah, there was also wine. Cheese people love wine and cheese. And wine. The next day there was a great cheese sale at Kendall College for all the leftovers. As I mentioned in a previous post, I had a lot of cheese. This year they're holding the conference in Austin, TX in August. I know. I don't get it either. Texas, August, Cheese. One of these things is not like the other. One of these things does not belong. Ok, I take it back. Texas does have good cheese. The Mozzarella Company is an awesome. Hoja Santa is a wonderful cheese and the Mozzarella Company is one of the most respected and well known in the cheese world, and Paula Lambert is a ridiculously knowledgeable and an expert in the field. All I'm saying is August? Texas? Really? Well, I am absolutely going to the conference this year. I've got money for the plane ticket,and I just need the time off, and about a grand for hotel and a conference pass. I'm sure I'll figure something out by August. 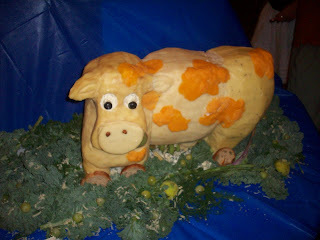 And yes, that is a cow carved out of cheddar. This is a very interesting matter ..I love cheese and I am in Austin. I consider a Cheese enthusias. I wonder what will be the only one Day to assist in this ACS Conference ?